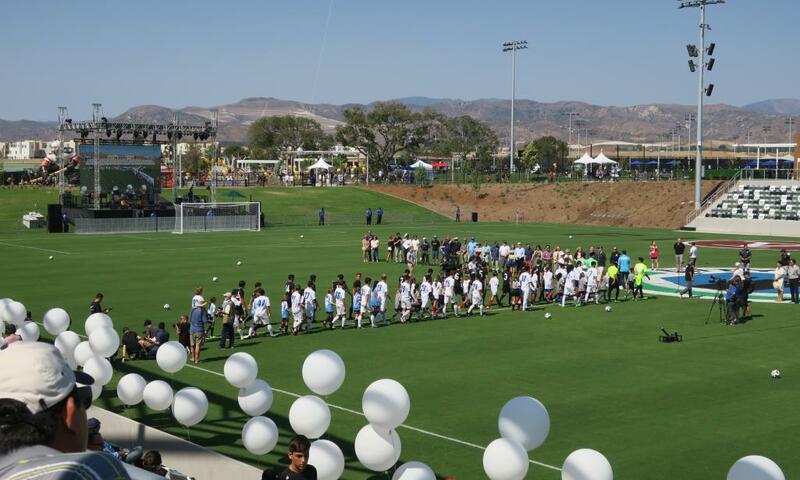 This Saturday, August 5th, marked the Orange County Great Park’s grand opening of its new Sports Park sponsored by Fivepoint Apartments. The 53-acre mass of land is home to 24 tennis courts, 6 natural-turf soccer fields, 1 acre dedicated to a children’s playground, and 4 sand volleyball courts. Amongst these fabulous facilities, I found myself in the championship soccer stadium, which holds up to 5,000 fans. I was excited to see this new addition to Orange County. I was once the kid sprinting from my mom’s mini van to the field in my cleats and ate orange slices at half time. My best memories were on Irvine soccer fields, and seeing the city invest in creating new memories for kids was inspiring. When I first got to the Sports Park, I made my way through the various exhibits the Great Park offers. I was particularly interested in the World War II aviation exhibit. Inside the original hangars I found kids and their parents standing in awe looking at the massive pilot planes and browsing the pop-up museum with war-era antiques. 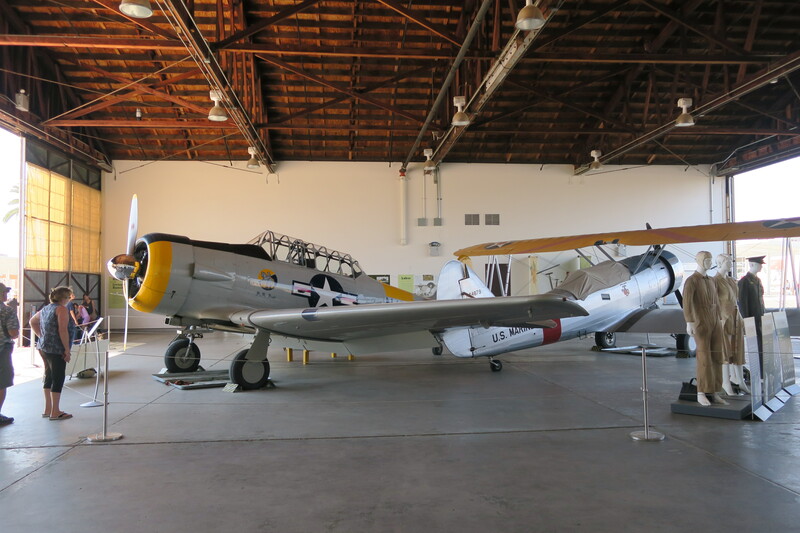 It is an important exhibit for children to see and I was happy to see Irvine making such a large effort to preserve some of its greatest history. I finally headed towards the new championship soccer stadium for the opening ceremonies at 3:30. I was shocked to see how large the field was and how open the layout was for visitors to see the entire game. 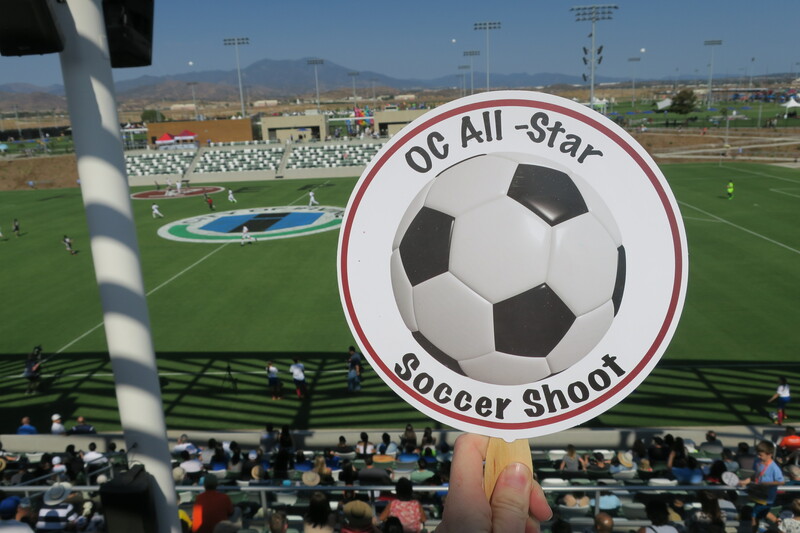 I was greeted with soccer-shaped fans—a thoughtful courtesy from the City of Irvine. There was no shortage of misters either. This stadium is state-of-the-art and certainly an improvement to what I had as a kid. The ceremonies hosted some of Irvine’s most prominent figures. Mayor Don Wagner was one of them, and gave an excellent speech on how important this Park is for the City of Irvine. He invited the Orange County Board of Supervisors representative Todd Spitzer to speak about the park. He mentioned that the land we were standing on was intended to be an international airport. “We’d be sitting in the United Airlines terminal right now.” He shared that the fight to keep the land from outside development was a difficult one but provided the opportunity to build the Sports Park to increase the quality of life for Irvine residents. After the opening ceremonies, I had the chance to visit the VIP lounge, where I felt like I was transported to the Kentucky Derby. Elevated on a balcony overlooking the field, women wore dresses with beautiful hats, and men wore linen suits. Wine was available to guests along with lounging areas and a stellar view of the stadium and Saddleback Mountain. I watched the local and elite high school soccer players battle off in a competitive match below. 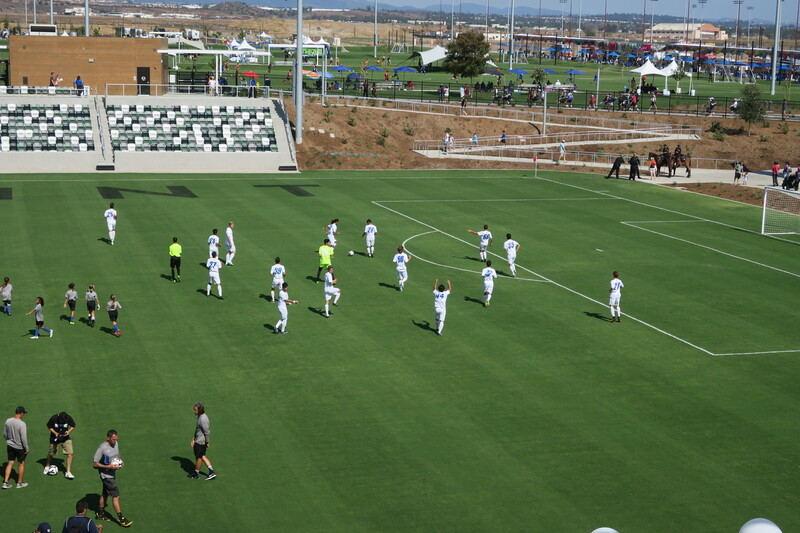 Overall, this Sports Park is a testament to Irvine’s commitment to the families of the community. They are aiming to foster an environment of unification in the growing city and provide genuine entertainment for its guests. I couldn’t be happier to see what Irvine has done to expand its already fantastic legacy. My 7-year-old self was smiling from ear to ear all afternoon in her ponytails and muddy shin guards. Katie recently graduated from the University of Kansas with a B.S. in journalism and a minor in business. She has returned to her hometown of Irvine with great appreciation and excitement to regain her status as a local. Destination Marketing department for a Los Angeles public relations firm. She has returned to the company post-graduation to work on a variety of hospitality clients in the U.S. and abroad. When Katie is not commuting to L.A., she is spending time rediscovering Irvine as a young adult and finding the best in dining, nightlife, and entertainment galore.